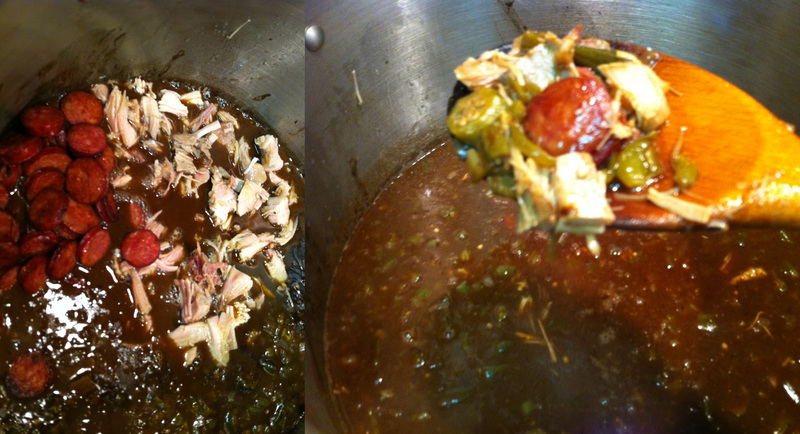 thanksgiving leftovers: smoked turkey and sausage gumbo | Is there any wine left? Whatcha doin’ later this week? If you’ve got a big turkey in your plans, then I have the perfect recipe for your leftovers. This recipe calls for smoked turkey, but you can use whatever kind you have this Thursday. There are two main types of gumbo — seafood and game. There are actually a bazillion-million-cajillion gumbo recipes out there. In fact, just about everyone has a unique recipe and I would encourage you to use this one as a jumping off point and make your own additions and changes. But the point I am making here is that most gumbo recipes pretty much all play off of the two variations mentioned above. When I was a kid and Momma made seafood gumbo, usually shrimp and lump crabmeat, it was always a special occasion. A pound of lump crabmeat is basically like gold, so we were taught to slowly fold it in after the gumbo was cooked so the lumps didn’t break up. Anyway, the other kind of gumbo – game – was really elevated in our house once we discovered Greenberg Turkeys. I think a business associate gave one to my dad as a Christmas gift one year when I was in high school. In my opinion, these honestly aren’t the best turkeys for carving and eating. For that, I prefer a really moist roasted or fried turkey. But damn, the smoked turkeys from Greenberg cannot be beat for making gumbo. 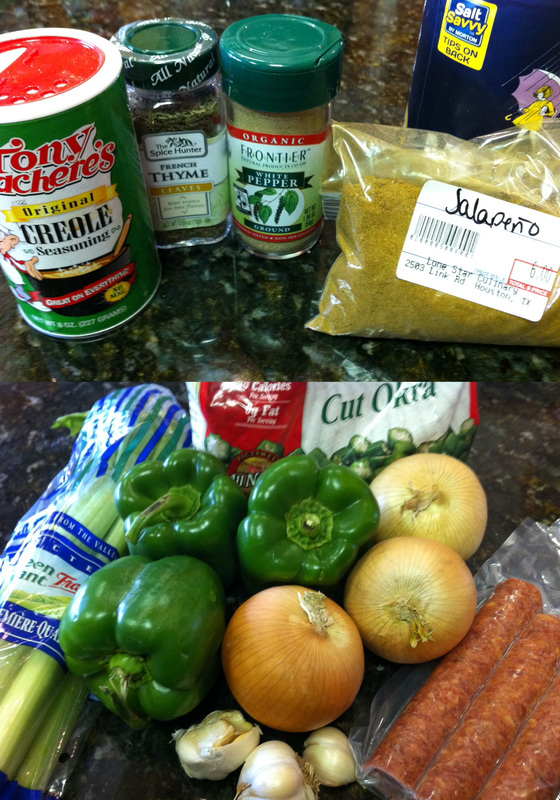 Here is what you’ll need to make smoked turkey and sausage gumbo. Top pic — seasonings. Bottom pic — everything else. Wait, where’s the turkey? Momma had already cut the meat off and boiled the carcass before I got to Baton Rouge so it was in the fridge and I forgot to take a picture. Okay, before we start, here is a lesson on roux. First, color. You may hear people say light rouxs are flavorless or a black roux is burned (not necessarily). Blond rouxs (like the one on the top left below) are actually ideal for etoufees and are very thick. The longer roux is cooked – and the darker it becomes – the less “thickening power” it has. 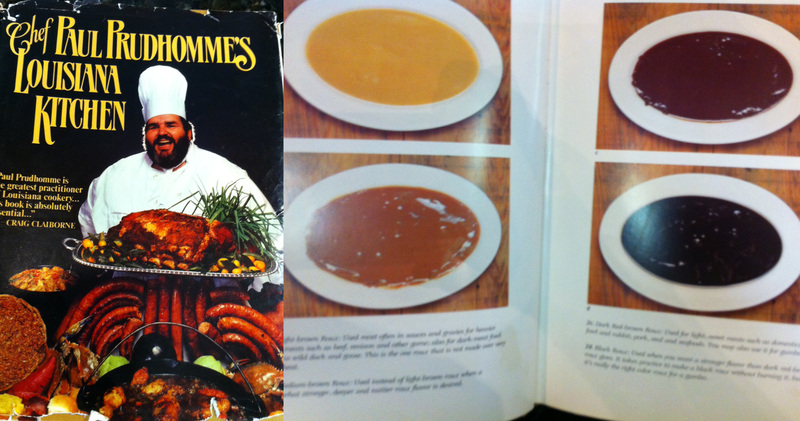 For gumbo, you want a brick roux, like the one on the top right in the picture below. It should be the color of a dirty penny. Okay, what do you do if you accidentally burn the roux? Throw it out. I’m serious. You can’t save it. Just cut your losses and start over. How should you keep it from burning? Do not stop stirring. At all. Your arms will be tired and you’ll think one second away won’t matter. But that is when the black flecks start appearing. Why do you cook the roux for such a long time? Because you are actually slowly caramelizing the flour and giving it more flavor. The darker it is, the more caramelized it becomes. Proportions of fat to flour? You’ll often hear one-to-one. While this is true, it is not one-to-one in mass (measuring cups); the correct measurement is one-to-one in weight. And finally, the kind of oil you use matters. Refined, or pure, canola oil has a smoke point in the 400s and is the best to use for making roux. 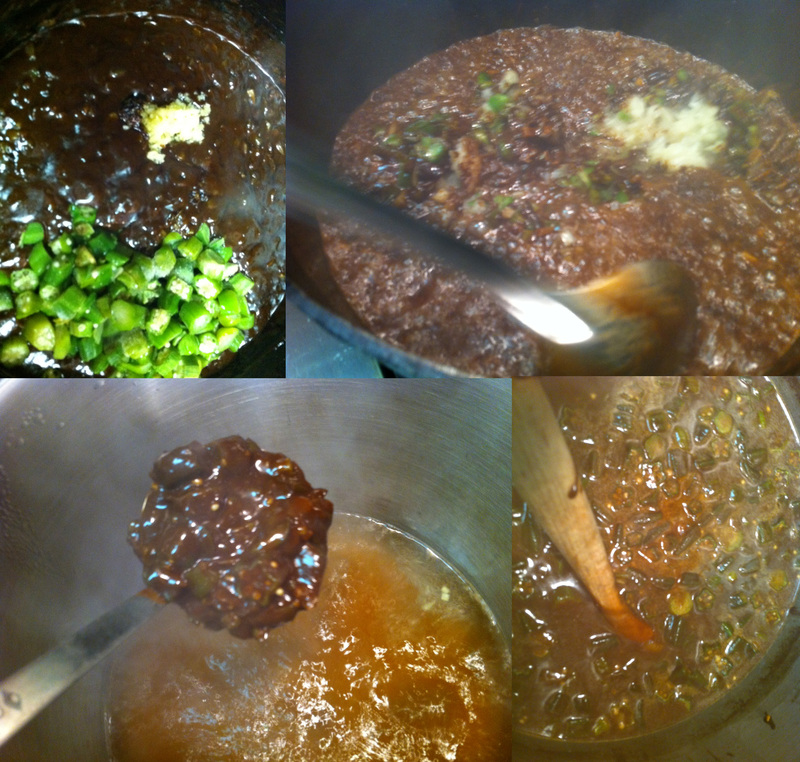 Here’s what our roux looked like over the course of an hour. You’ll be about two Abitas in before you see a noticeable change in color, then it starts to darken more quickly. See the different utensils I am using? When you first add the flour to the oil, you want to whisk all of the lumps out. Since you’ll be stirring for such a long time, use a wooden spoon so it doesn’t heat up in your hand. But keep a metal spoon with a flat edge on hand for scraping the bottom of the pan every few minutes or so. So the step by step goes like this. Heat your oil in the microwave in a glass measuring cup in 30-second increments until it is hot but not bubbling. Add it to your cast iron dutch oven that has been sitting on the stove over medium heat. Once it starts bubbling, which will be shortly, add the flour. This will pop, so keep your hands away for a second. Then, whisk, whisk, whisk until it is well-combined. Grab a wooden spoon and start stirring. Every 5-7 minutes, trade out the wooden spoon for something that can really scape the bottom of the pan. You want to keep incorporating this into the roux so it doesn’t stick to the bottom and burn. From start to finish, the roux will take about 45 minutes – 1 hour of stirring. I’d recommend doing this with a friend, sister, mom, husband, etc. — someone who can relieve you every few minutes while you run outside to grab another beer. Did I mention chopping the veggies? Do this before you start making the roux. You will need to add these the second the roux reaches the right color so you need them to be ready to go. Once the roux has turned the color of a dirty penny, add the chopped onion, bell pepper and celery (the Holy Trinity of Southern cooking). Turn the heat down to medium-low and stir until the roux coats each vegetable, then cover and let steam until wilted, about 5-8 minutes. Add the garlic and cut okra. Sweat until the okra is softened. Bring about 7 quarts of stock to a boil in a large stock pot and then begin to add roux/vegetable mix to the stock stirring to dissolve as it is added. Turn the heat down to simmer and cover the pot. 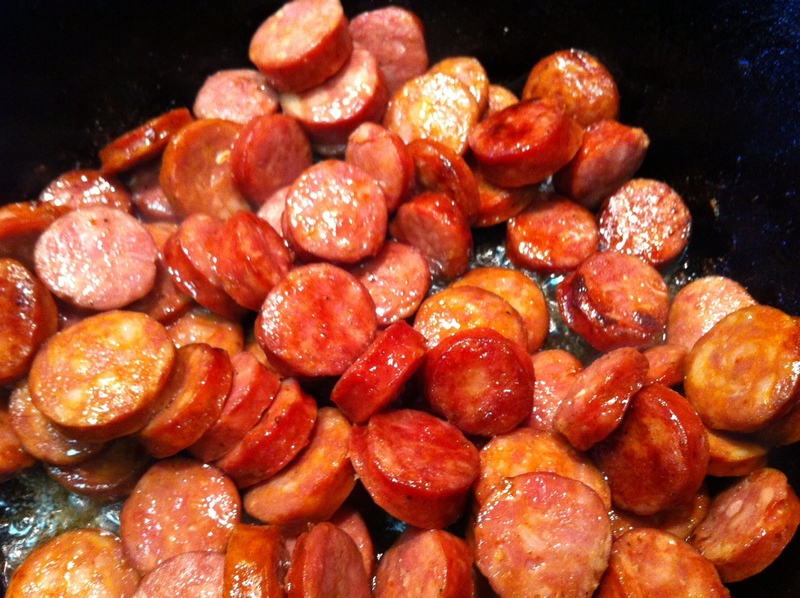 Meanwhile, slice the sausage into 1/4″ thick rounds and brown it in a skillet. This will give it extra flavor but also gets rid of some of the fat and grease that comes out while cooking sausage. Once it has browned, set it aside. Back to the gumbo. While simmering, add the seasonings. Continue to simmer for about 30-45 minutes. 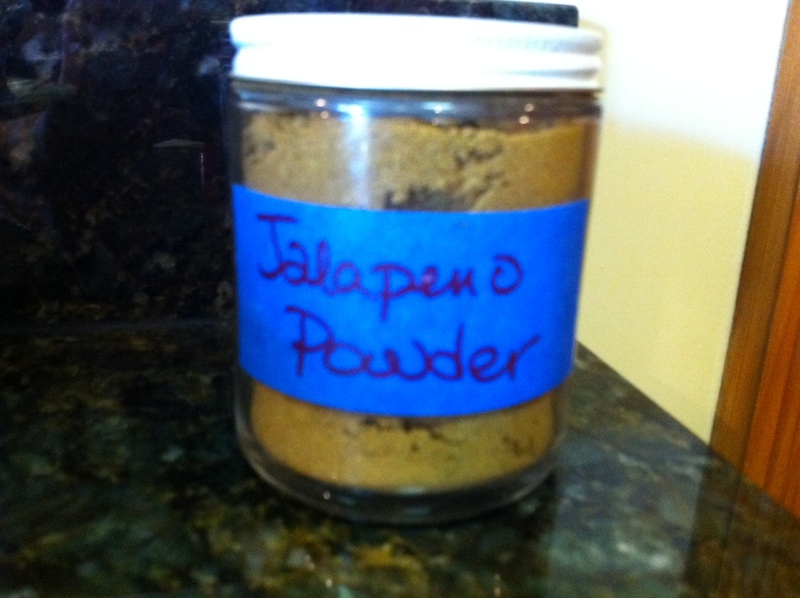 The jalapeno powder below will lose its flavor before the jar is even halfway empty. That is because you barely need a teeny tiny little pinch to give the whole pot a great flavor. This stuff is made from ground jalapenos and seeds, and it is fiery! Jalapeno powder isn’t really sold in grocery stores, but you can find it at spice markets. The stuff below is from Flores Spices & Herbs in Houston on Airline Drive near all of the farmers’ markets. Bottom line: if you can’t get your hands on any, just use cayenne. It will still be delicious! After the gumbo has simmered for 30-45 minutes with the seasonings, add the cubed turkey and continue to simmer for about 30 minutes longer, and then add the sausage and turkey which came off of the bones when making the stock. Simmer for 30 more minutes and adjust seasoning to taste. Serve over white rice or jambalaya rice. Turkey and Sausage Gumbo freezes really well. If you don’t think you can make it through all two gallons in the next few days, portion it out into smaller containers and freeze. You know what else freezes well? Cooked rice. And that makes for a super easy dinner in a few weeks. Remove and discard all skin from the turkey. Remove the breast from the carcass and cut most of the thigh and leg meat from the bones. Cut the meat into bite size cubes/pieces and reserve to add later. Break the carcass at the joints and put in large stock pot; add enough water so it’s covered by an inch or so of water. Bring it to a simmer. Skim off anything that rises to the top that you wouldn’t want to eat if you saw it floating in a bowl of soup. As soon as it comes to a simmer, put it in the oven at 180 degrees. Leave it in the oven for 4-5 hours. As long as it’s not bubbling you’re good. It should not be bubbling, but it should be too hot for you to hold your hand against for more than an instant. About an hour before you want to take it out of the oven, add the vegetables, herbs and peppercorns. Continue cooking for another hour Remove the bones and meat and after cooling, separate the meat from the bones and reserve for later use. Strain the stock through a colander, then cheesecloth. Now it’s ready to use or chill it and take the fat that congeals off the top. Slice the sausage in half lengthwise, then slice into ½-inch slices. Saute in a skilled until browned. Heat the oil in a large Dutch oven and add the flour, stirring til smooth. Cook slowly, stirring constantly, till you have a very dark red/brown roux. Just as the roux turns the right color, add the onions, celery and bell peppers to the roux to stop it from cooking and cook the vegetables until wilted. Add the garlic and cut okra. Sweat until the okra is softened. Bring about 7 quarts of stock to a boil in a large stock pot and then begin to add roux/vegetable mix to the stock stirring to dissolve as it is added. While simmering, add the seasonings. Simmer for about 30-45 minutes. Add the cubed turkey and continue to simmer for about 30 minutes longer, and then add the sausage and turkey which came off of the bones when making the stock. Simmer for 30 minutes and adjust seasoning to taste. Fun and informative post. Thank you for including the detailed photos!